In this beautiful VIS image, taken by the NASA - Mars Odyssey Orbiter on November, 11th, 2009, and during its 35.086th orbit around the Red Planet, we can see a small portion of the Martian Region known as Terra Sirenum. Terra Sirenum is a large Region located in the Southern Hemisphere of Mars. It is centered at about 39��42�' South Latitude and 150��00' W﻿est Longitude and it covers (roughly) 3900 Km (such as about 2421,9 miles) at its broadest extent. Terra Sirenum is - mostly - an Upland Area notable for massive cratering, including the large Newton Crater. Terra Sirenum is found in between the Phaethontis Quadrangle and the Memnonia Quadrangle of Mars. However, a (relatively small) Low Area of Terra Sirenum is believed to have once held a Lake that, eventually, drained through Ma'adim Vallis. 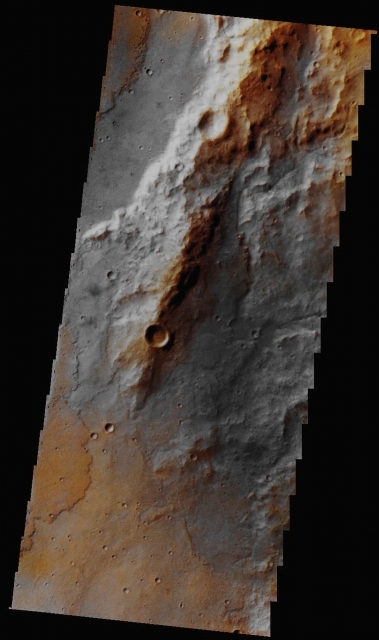 This image (which is an Original Mars Odyssey Orbiter falsely colored and Map-Projected frame published on the NASA - Planetary Photojournal with the ID n. PIA 20426) has been additionally processed, magnified to aid the visibility of the details, contrast enhanced and sharpened, Gamma corrected and then re-colorized in Absolute Natural Colors (such as the colors that a normal human eye would actually perceive if someone were onboard the NASA - Mars Odyssey Orbiter and then looked down, towards the Surface of Mars), by using an original technique created - and, in time, dramatically improved - by the Lunar Explorer Italia Team.